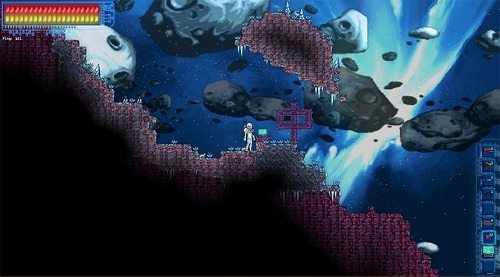 Edge of Space lets you explore a strange planet in 2D Terraria style. 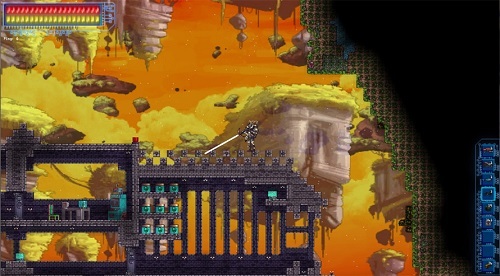 The game focuses on exploration and combat with plenty of depth to it. With support for both single player and multiplayer gameplay it’s perfect for both solo and team adventurers. While it’s easy to draw comparison to the like of Terraria and Starbound, the game focuses on a different experience and level of pacing that it does give it a unique vibe. In Edge of Space players are sent to a distant corner of the universe on behalf of the Ark Corporation. Your task is to survive in the dark unexplored parts of the universe where you’ll run into all sorts of monstrous enemies. Players are encouraged to terraform the world around them to make it a more habitable experience while battling monsters and even bosses. Combat is definitely a thriving part of the game as you hunt down the stranger inhabitants with plenty of “what is that” moments. This journey to creating a safe and thriving settlement for yourself is a long one with plenty of resource collection and crafting in between. With the opportunity to craft weapons (mostly guns), armour, kits, pets and other technologies (turrets, drones) you’ve got plenty of options in how you approach the adventure ahead. These kits are arguably the most important and provide you with tools for resource gathering and energy (to power your jetpack and other character aspects). With an amazingly deep crafting system you’ll find that you can use every material that you collect. Either to create more advanced materials or using them directly in the creation of a new item. With information on every item provided through your inventory and a crafting screen that outlines everything you need to know it is easy stay in the game instead of referring to an external wiki every few minutes. To top of the entire experience you’ll find Edge of Space has a great list of available biomes, backdrops and sounds that add that extra layer of polish to bring the game to life. Explore a strange new world in 2D style. Deep crafting system with plenty of items and paths to take. Great biome variety that combines with visually attractive backdrops. Lots of insane creatures to battle. Play alone or with friends on Windows.